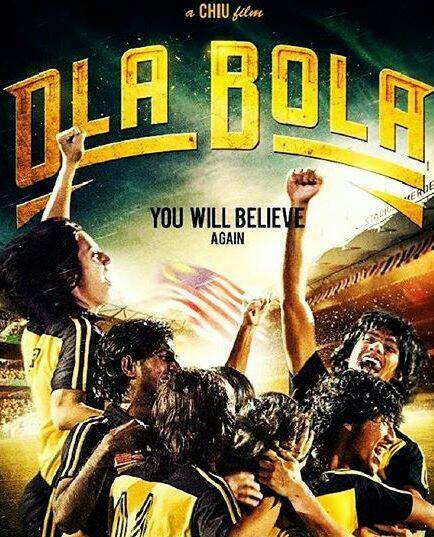 Ola Bola review (no spoilers in your comments please): Just watched Ola Bola, laughed and bawled my eyes out from the rubber-tapping scene onwards. Contrived, clichéd, predictable in parts — but what a tour de force of nostalgia. It reminded me of football — playing it and watching it with the family on the black and white TV and cheering for Selangor and Malaysia, and Leeds United on Sundays. I remember the Tango ball of 1978 and how we diehard World Cup fans of Form 2 in St John’s, saved our allowances and all pitched-in to buy it. We then stayed back after school to rumble on the field, soiling our shirts and muddying our pristine white Bata shoes. I remember on one occasion breaking my collarbone, for which I received an angry reprimand from mum, after a visit to GH. I remember Christopher Lim Lean Chai was our own ‘taukeh’ playmaker/defender. He didn’t join the school team, despite his talent, because his parents refused to let him. I remember Soh Chin Aun, Santokh Singh, M Arumugam, M Chandran, Shukor Salleh, Isa Bakar, Khalid Ali, James Wong and Mokhtar Dahari as clearly as the 1975 Hockey Team, or the All England or Thomas Cup badminton players of the 70s and 80s. They were our childhood idols and we as a nation gravitated to them as we did to Ali or Elvis or Bruce Lee. They were all our heroes once. The movie captures the fact that commonfolk among us could rise above their dire circumstances and become extraordinary — for just one day. Today we look to Nicol, Chong Wei, Pandelela and Azizulhasni to remind us that there are still those bearing the torch for us on the international stage, who make us proud, even as our political leaders shame us everyday with their false patriotism, corrupted commitment and warped sense of integrity. I cried for all the humanity we lost as a nation in that era. And for our chidren who now live in times of unlimited access, who look to violent, wise-cracking superheroes as their mentors and idols and who believe the game of life can be played over and over again with no repercussions to those you hurt with your attitude, rage, extremism and intentional meanness. Ola Bola, for all its flaws in the acting department, racial stereotyping and manipulative storytelling, still holds a mirror up to what we left behind. It holds a flickering candle up while others try to darken our history and negate our place in this country. Drenched in patriotic fervour with fellow Malaysians in that cold theatre, it warmed my heart. And I’m sure, if you were a child of the 70s, it will warm yours too. When the going gets tough, the weak point fingers. 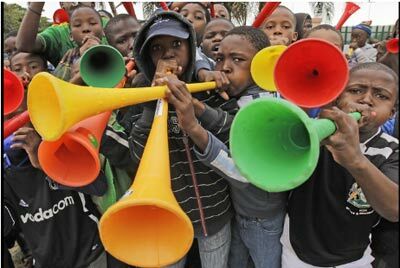 World Cup fans have heard it all before. But here’s a list of excuses — some old, some new — now that the tournament is over for 16 of the teams and the blame-game has begun. Coaches of Slovenia and Algeria have blamed the pitch for the lacklustre performances in the Group C match at the Peter Mokaba Stadium, which features an artificial turf containing millions of synthetic grass fibers woven between and beneath the natural grass. Coulibaly was dropped by FIFA for the next round of matches much to the relief of the Americans who made it to the last 16. Outgoing French coach Raymond Domenech will likely take the most flak for the French team’s petty internal squabbling off the pitch and poor showing on it. To his credit, Italian coach Marcello Lippi who earlier blamed the “altitude training and fatigue” for the Azzurris poor showing has come clean for their early exit. Highly-paid “foreign” players are often the target for their egos, poor teamwork and lack of loyalty and commitment for their country. The six biggest egos of the World Cup came under scrutiny and will likely be blamed when their teams lose. Fatigue from busy domestic schedules prior to the World Cup is the same excuse strutted out every four years. “The players play too many games during the [insert professional league] (ie. Premier League/La Liga/Serie A/Bundesliga/FA Cup/etc) that they are too exhausted to perform during the World Cup.” Ho hum. 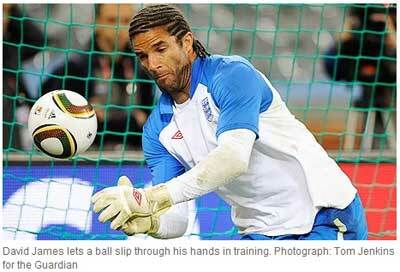 English goalie Robert Green’s fumble cost him dearly and he was replaced by David James, who has a reputation for doing the same. By the way, the Jabulani ball doesn’t seem to be giving the Japanese any probs after two “inch-perfect” freekicks. Evra blamed “the traitor among us” after the infamous Anelka-Domenech bust-up in the locker room was reported in L’Equipe. 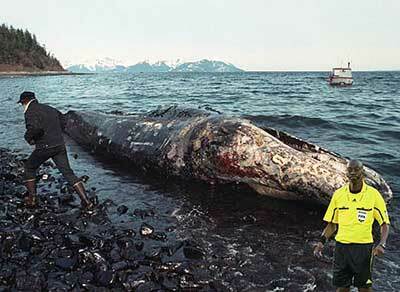 “The problem of France is not Anelka, but the traitor among us. We must eliminate the traitor from the group, because he wants to hurt the team.” Domenech left Evra out in the last game presumably because he was still sniffing around for the rat. Spanish football fans blamed their shocking World Cup defeat to Switzerland on their keeper’s stunning girlfriend. 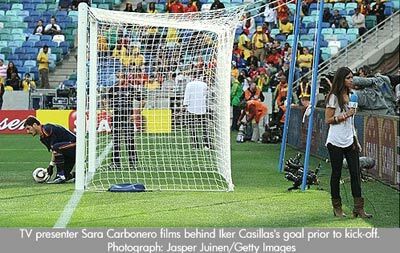 Apparently Iker Casillas was distracted by the presence of TV presenter Sara Carbonero, who stood on the sidelines throughout the match, barely meters away from her beau as the much-touted favourites lost 1-0.